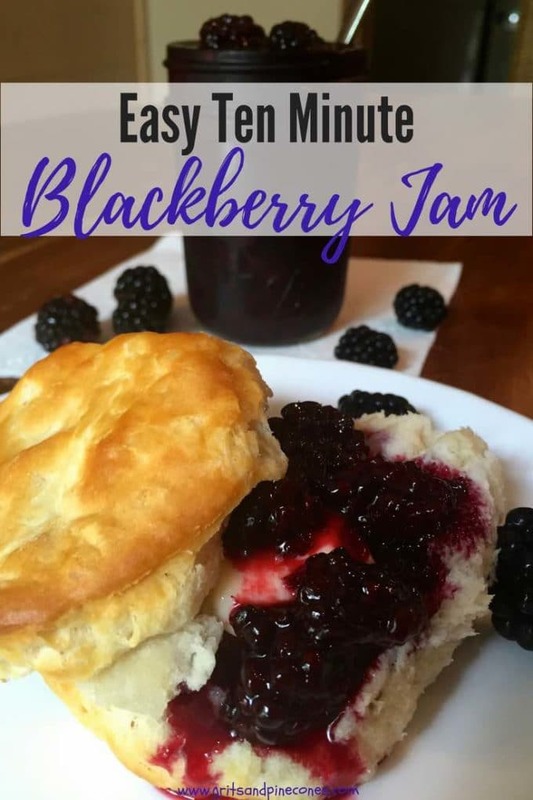 My easy Ten Minute Microwave Blackberry Jam recipe only takes three ingredients and ten minutes to make the most delicious, incredibly fast and easy Blackberry Jam you have ever tasted! It’s the middle of July, and I’m obsessed with the abundance of fresh fruit and vegetables at the farmers’ markets. 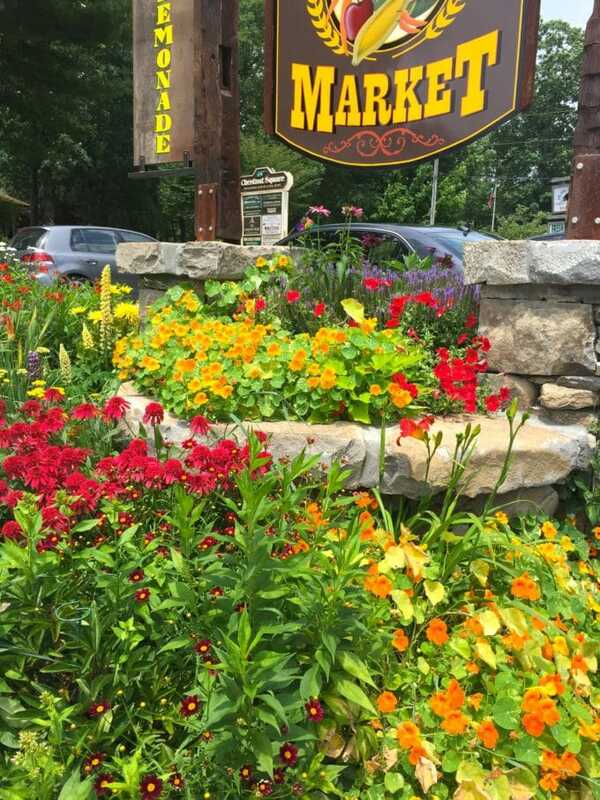 We happened to be up in Cashiers, NC, recently and they have the best farmers market! It’s not only full of fresh berries, fruits, and vegetables, but they also have wonderful homemade fruit pies, jams, and jellies, pickles, chutneys, homemade biscuits, you name it, they have it! Also, they have beautiful sunflowers and huge dahlias, and the so-called icing on the cake, they make fabulous barbecue pork every day. The only problem is there is always a line of hungry folks waiting to pick it up. If you happen to be traveling this summer in western NC, be sure to stop by and explore this treasure. I’m sure by now you must be thinking, this is nice, but what does it have to do with Easy Microwave Blackberry Jam? Well, I am getting to that. 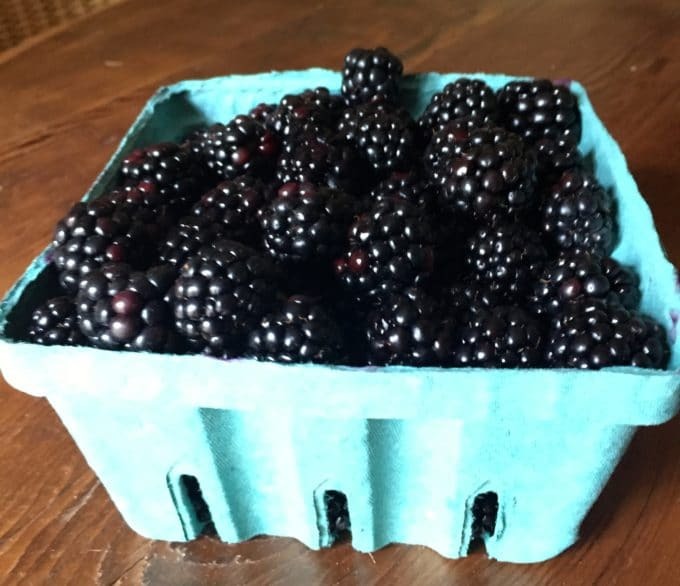 Remember the luscious blackberries I told you about that I bought at the Farmers Market and added to the Peach and Blackberry Crumble I made last week? Well, I had some blackberries leftover, so I decided to make Ten Minute Microwave Blackberry Jam. Did you know you could make jam or preserves in the microwave? 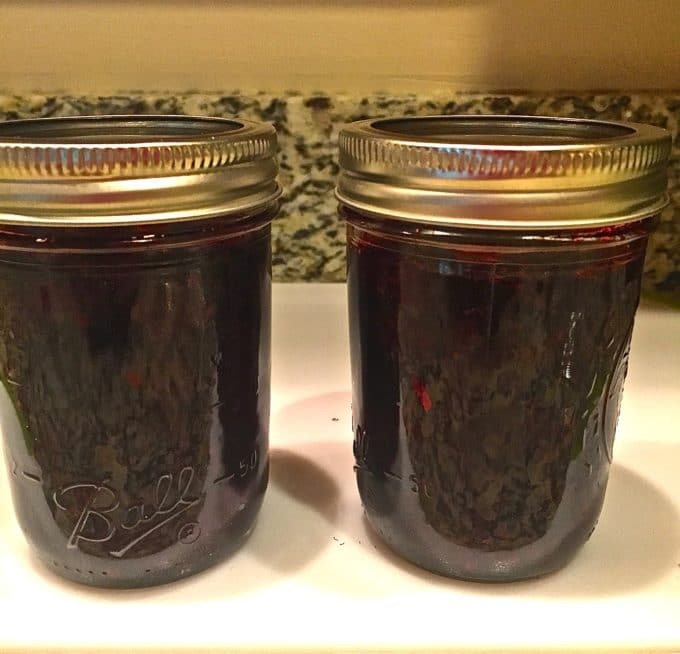 I kid you not, with only 3 ingredients, and about 10 minutes in the microwave, you will have some of the most delicious, incredibly fast and easy Blackberry Jam you have ever eaten. 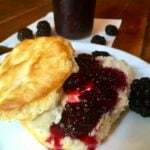 Because it isn’t set with pectin, this jam is a little syrupy, and besides being wonderful on biscuits, it is also fabulous drizzled over my Easy No-Cook Meyer Lemon Ice Cream, waffles, pancakes, Hoecakes aka Cornmeal Pancakes or my personal favorite Frozen Lemonade Pie. It’s simply scrumptious! You also may be wondering what the difference is in preserves and jam? Well, these two terms are used almost interchangeably but most of the time preserves will have bigger pieces of fruit in them. 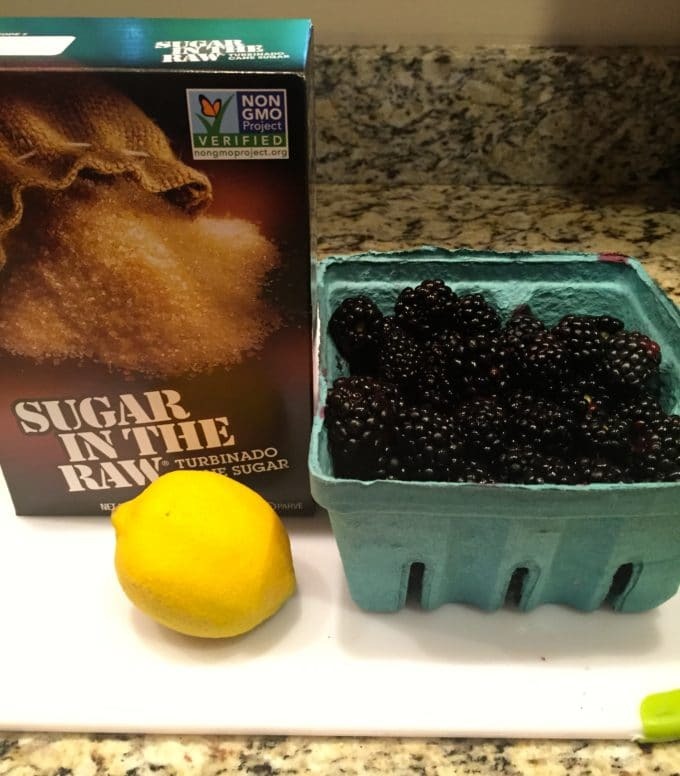 If you are convinced that this Ten Minute Microwave Blackberry Jam is something you have to make, gather your 3 ingredients which are blackberries, sugar, and fresh lemon juice. That’s it! I know, it’s hard to believe, but it’s true! First, place the sugar in a large microwave-safe bowl, microwave on high 2 minutes or until the sugar is warm. Stir in the blackberries. Cover with plastic wrap or wax paper, but fold back one edge so the steam can escape. Microwave on high for 1 1/2 minutes, remove and stir and microwave again for another 1 1/2 minutes or until the sugar dissolves. Uncover and microwave on high 8-10 minutes more or until the berries are very soft and the liquid has reduced and slightly thickened. Stir in lemon juice. Cool, cover and chill in the refrigerator overnight. The jam will continue to thicken as it chills. Store in your refrigerator for up to 1 week. Enjoy! Easy Microwave Blackberry Jam only takes 3 ingredients and 10 minutes, to make the most delicious, incredibly fast and easy Blackberry Jam you have ever tasted. Uncover and microwave on high 8-10 minutes more or until the berries are very soft and the liquid reduces and thickens slightly. The nutrition label below is for 1 6 oz jar of jam.